This was from The Times, today. Photo caption reads: The Hampstead Pals visit the grave in Arras of the police constable Charles Pope who was killed in 1917 and was posthumously awarded the Victoria Cross. Over beans on toast in the Hampstead Police Station canteen one September morning 35 years ago, a 29-year-old police sergeant, Jon Nicholls, was holding forth enthusiastically about the five days he had just spent exploring the First World War battlefields and cemeteries of the Somme. Somewhat to his surprise, he found that he had tapped into the remarkable affinity that many serving and retired police officers seem to feel with the men and boys who, nearly 100 years ago, served with the British Expeditionary Force. The upshot was that Nicholls and ten colleagues decided to form a travel club of police officers and their friends, dedicated to making regular pilgrimages to significant First World War sites in France and Belgium. At the suggestion of a Great War veteran whom Nicholls met by chance while on patrol, they called the club the Hampstead Pals in memory of the Pals’ Battalions in which friends, neighbours and workmates served together in the war. Although Nicholls had never known his maternal grandfather — who died in about 1930 from the effects of being gassed in the war — his interest in the men who served was kindled at the age of 7 when his grandmother gave him some of his grandfather’s old magazines, including a run of The Times History of the War, published when The Times was owned by Lord Northcliffe. The Pals’ first trip — to the Somme — was in May 1978. “Like everyone who goes, we were all of us hugely moved — particularly by the ages of the lads in grave after grave, and the tragedy that so many lives were over before they’d properly begun,” says Nicholls. Since 1978 the Hampstead Pals (who have a mailing list now in excess of 300) have proved remarkably regular repeat visitors to the Western Front. 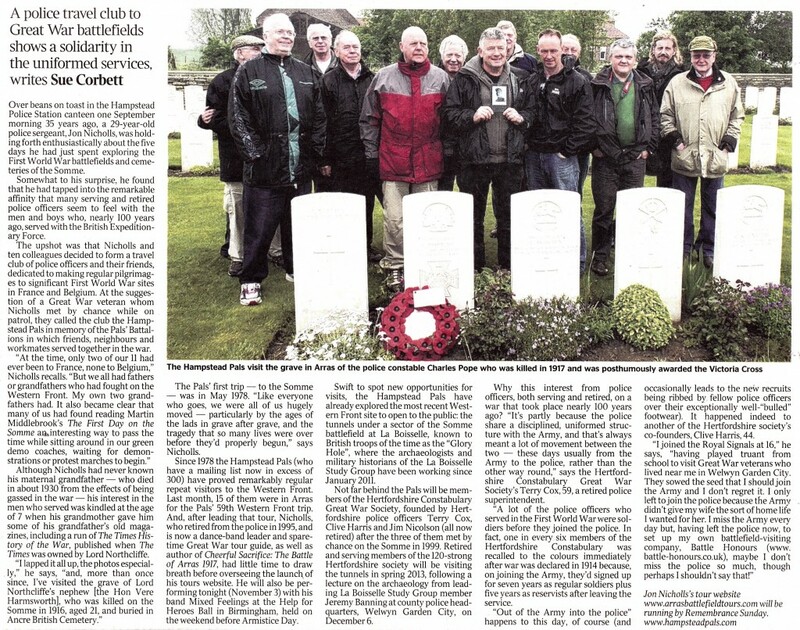 Last month, 15 of them were in Arras for the Pals’ 59th Western Front trip. And, after leading that tour, Nicholls, who retired from the police in 1995, and is now a dance-band leader and spare-time Great War tour guide, as well as author of Cheerful Sacrifice: The Battle of Arras 1917, had little time to draw breath before overseeing the launch of his tours website. He will also be per-forming tonight (November 3) with his band Mixed Feelings at the Help for Heroes Ball in Birmingham, held on the weekend before Armistice Day. Swift to spot new opportunities for visits, the Hampstead Pals have already explored the most recent Western Front site to open to the public: the tunnels under a sector of the Somme battlefield at La Boisselle, known to British troops of the time as the “Glory Hole”, where the archaeologists and military historians of the La Boisselle Study Group have been working since January 2011. Not far behind the Pals will be members of the Hertfordshire Constabulary Great War Society, founded by Hertfordshire police officers Terry Cox, Clive Harris and Jim Nicolson (all now retired) after the three of them met by chance on the Somme in 1999. Retired and serving members of the 120-strong Hertfordshire society will be visiting the tunnels in spring 2013, following a lecture on the archaeology from leading La Boisselle Study Group member Jeremy Banning at county police head-quarters, Welwyn Garden City, on December 6. Why this interest from police officers, both serving and retired, on a war that took place nearly 100 years ago? “It’s partly because the police share a disciplined, uniformed structure with the Army, and that’s always meant a lot of movement between the two — these days usually from the Army to the police, rather than the other way round,” says the Hertford-shire Constabulary Great War Society’s Terry Cox, 59, a retired police superintendent. “A lot of the police officers who served in the First World War were soldiers before they joined the police. In fact, one in every six members of the Hertfordshire Constabulary was recalled to the colours immediately after war was declared in 1914 because, on joining the Army, they’d signed up for seven years as regular soldiers plus five years as reservists after leaving the service. “Out of the Army into the police” happens to this day, of course (and occasionally leads to the new recruits being ribbed by fellow police officers over their exceptionally well-“bulled” footwear). It happened indeed to another of the Hertfordshire society’s co-founders, Clive Harris, 44. Article is by Sue Corbett from The Times, November 3rd, 2012.